At present there is saturation coverage by classical music's online activists of the possible cultural and humanitarian impacts of Britain leaving the EU. As someone who voted 'remain' in the EU referendum I share these concerns; but I also share concerns about other far more devastating cultural and humanitarian impacts which are being conveniently swept under the carpet by the same activists. 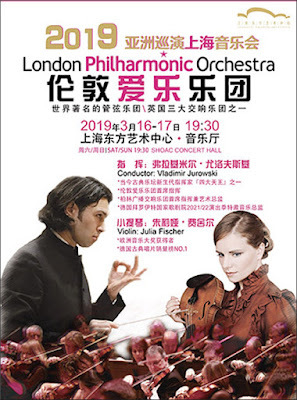 Next month the London Philharmonic Orchestra and Vladimir Jurowski tour China, with their Peking concert including Stauss' 'Till Eulenspiegel's Merry Pranks'. 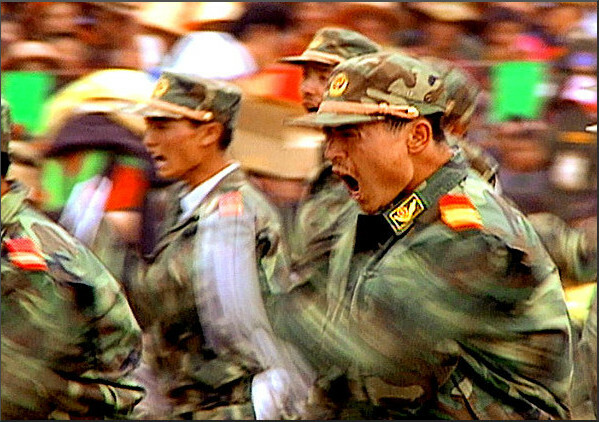 The accompanying images* are from archive footage used in Tom Peosay's 2003 documentary 'Tibet: Cry of the Snow Lion', a film which a New York Times review described as "an impeccably made, often moving account of the captive nation of Tibet, forcibly annexed by China more than 50 years ago". 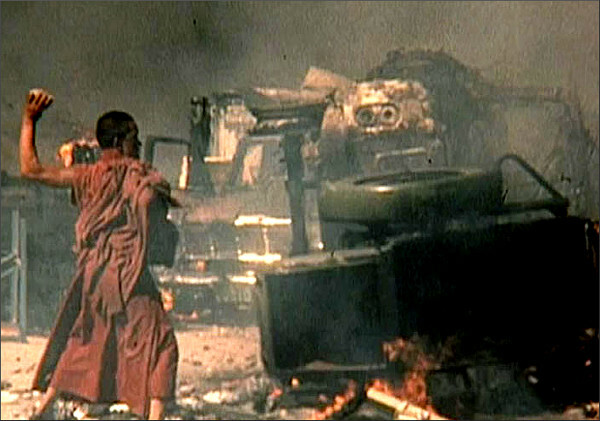 Institutions of government and education were systematically destroyed; the Buddhist religion was labeled a "disease to be eradicated"; nearly 1.2 million out of about 6 million died through armed conflict and famine; large numbers of Tibetan children were forcibly taken from their families and sent to Chinese orphanages for "reeducation." Research suggests that close to 1 million Tibetans tried to escape to India, Nepal, Bhutan or other regions of their country, but given the vast distances, lack of food in mountainous terrain and military invasion, most either surrendered to the Chinese or died in flight. In the end, only 110,000 Tibetans survived the journey over the Himalayas to join the Dalai Lama in India. 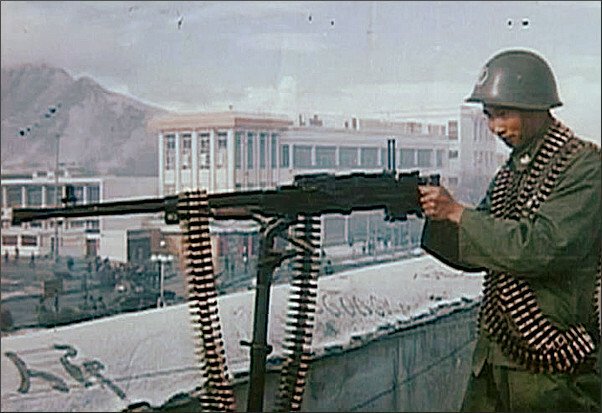 The testimony of many of these refugees was gathered by the International Court of Justice and presented in its 1959 report "The question of Tibet and the Rule of Law." [Chinese] authorities dramatically stepped up repression and systematic abuses against the 13 million Turkic Muslims, including Uyghurs and ethnic Kazakhs, in China’s northwestern Xinjiang region. Authorities have carried out mass arbitrary detention, torture, and mistreatment of some of them in various detention facilities, and increasingly imposed pervasive controls on daily life. New regulations in Tibet now criminalize even traditional forms of social action, including community mediation by religious figures...Human rights defenders continue to endure arbitrary detention, imprisonment, and enforced disappearance. The government maintains tight control over the internet, mass media, and academia. Daniel Barenboim - another guest of China - set the precedent at the 2017 Proms for using the podium as a platform for political views. So will we see Vladimir Jurowski making a speech from the podium in Beijing decrying the totalitarian Chinese regime? Or will the lure of a market for classical music of 1.4 billion people keep him and classical music's online activists toeing the Chinese party line? Of course orchestras need to earn a living by touring, and I am not proposing that that the LPO and other leading orchestras should boycott China or other humanitarian-challenged regions such as the United Arab Emirates. But I am proposing that a little more balance in the coverage of cultural and humanitarian impacts would be a good thing. Watch 'Tibet, Cry of the Snow Lion' via this link**. Now over to classical music's online humanitarian activists. * Images from Earthworks Films Inc. ** The copyright position of this YouTube upload is not clear; however I am linking to it because it is such an important and moving document. New Overgrown Path posts are available via RSS/email by entering your email address in the right-hand sidebar. Any copyrighted material is included for critical analysis, and will be removed at the request of copyright owner(s). Sadly, classical musicians tend to be no more discriminating than pop stars and actors and generally support fashionable rather than contrarian opinions. Making a stand on the environment or gay rights may be a useful contribution but brings nothing new to the party. Not many Erich Kleibers about today, sadly.